The world was supposed to end on December 21st, 2012. Or at least, some people thought so. One of the proposed hypotheses was that on that fateful December day the magnetic poles would switch, north would be south and south would be north, and this, somehow, was going to make things very very bad for us humans. Of course, this didn’t happen. Surprisingly, predictions based on the end of a calendar by an ancient civilization that didn’t even know what geology was turned out to be wrong. Strange. That said, geomagnetic reversal is a real phenomenon and poles do swap around all the (geological) time. In the last 20 million years the magnetic field has reversed approximately every two to three hundred thousand years, though the last time it happened was 780 thousand years ago, called the Brunhes-Matuyama reversal. During the time of the dinosaurs reversals occurred less often, once every million years or so. These time periods in between reversals are called chrons. Superchrons are time periods during which the earth’s magnetic field did not reverse for more than ten million years. There are at least two of them of which we are certain. 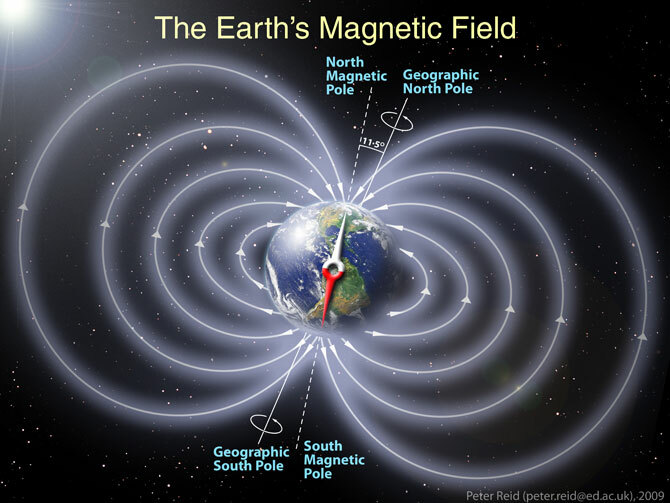 Geologists are quite sure that the earth’s magnetic field comes from the earth’s core. More specifically, the earth has an inner core made of solid iron, surrounded by a layer of hot molten metal. As the liquid metal flows around the inner core, it creates an electrical current, which in turn creates the magnetic field. Because the core is moving, so is the magnetic field. In fact, since it was originally precisely located in the 19th century, the earth’s magnetic north pole has moved by over 1000 km. As far as we know, reversals take about one thousand to ten thousand years to complete, though there is evidence that suggests that some have happened in a much shorter time. Geomagnetic reversals were once thought to be linked to mass extinctions, but this seems to not be the case. The hypothesis was that the magnetic field would severely weaken or would disappear during a reversal. No longer protected, the earth would be bombarded by dangerous high-energy particles, and possibly stripped of its atmosphere. After all, we think that Mars does not have an atmosphere anymore because it doesn’t have a magnetic field to protect it. While the magnetic field does decrease during a reversal, it never completely goes away. Solar radiation would increase, but not enough to be deadly. Also, our planet’s atmosphere is quite thick and would also protect it. Statistical analysis shows that there is no correlation between reversals and mass exctinctions (Glassmeier, 2010).